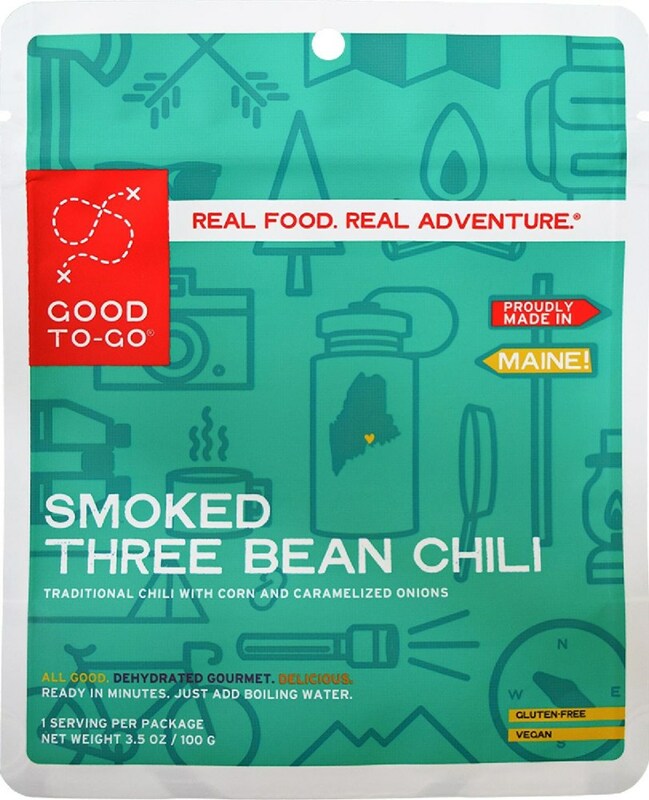 This is the latest addition to a line-up of six Good To-Go "all natural, dehydrated gourmet" meals. I found the product to be a fresh, healthy, and tasty alternative to the ever-growing line of pre-packaged, dehydrated backpacker meals on the market. I would highly recommend this product for those specifically looking for an all-natural, gluten-free, vegetarian option. It works well as both a stand-alone meal and as a side dish. The downsides are the higher retail cost and longer re-hydration time when compared to other similar products. I also found that some ingredients did not rehydrate fully, even given the full recommended prep time. 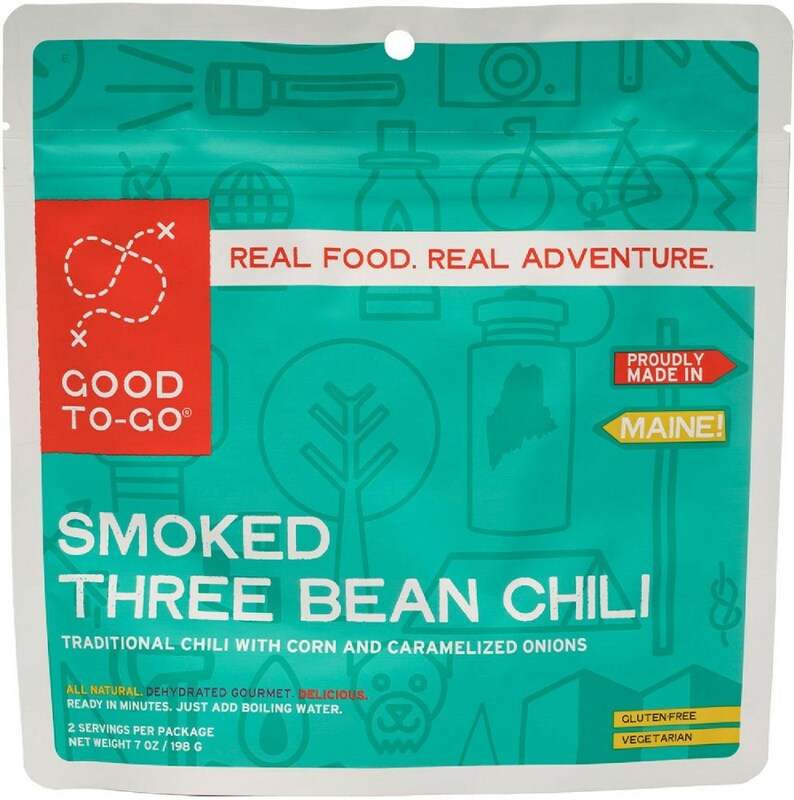 I tested the Good To-Go line of dehydrated foods two years ago when they were first introduced. At that time, only three options were offered. The company seems to be experiencing success and growth, having since added three more meals. 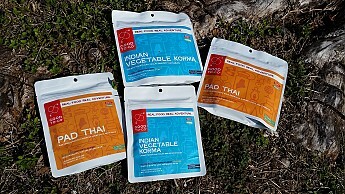 This time around, I tested the Pad Thai and Indian Vegetable Korma meals, both in single and double serving sizes. This review is of the Indian Vegetable Korma. 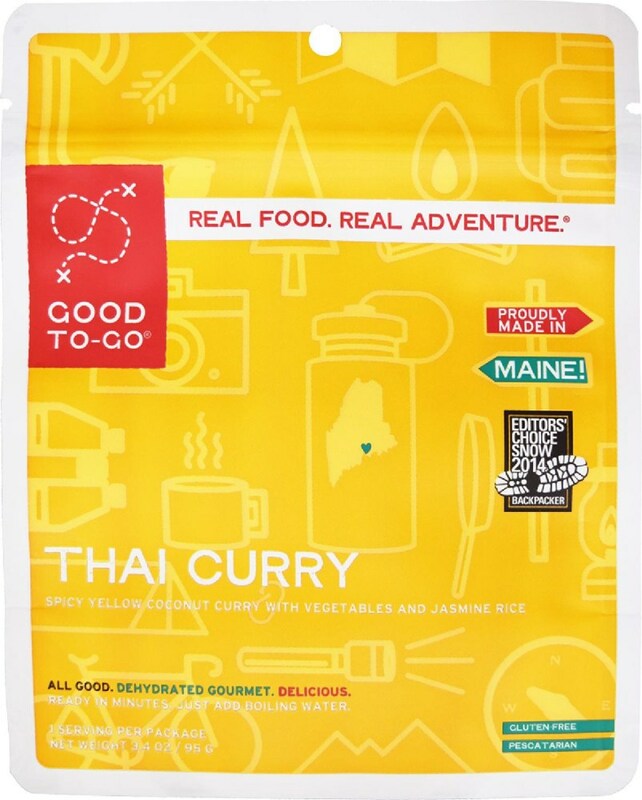 Please see my other reviews of the Thai Curry, Smoked Three Bean Chili, Herbed Mushroom Risotto, and Pad Thai on Trailspace.com. 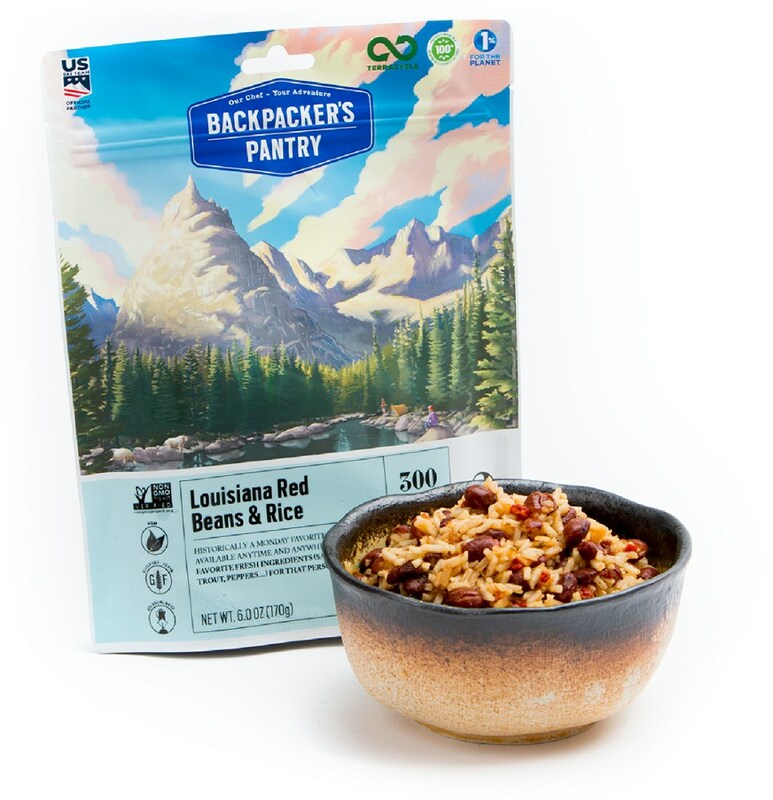 In previous reviews, I described in some detail my minimalist approach to backcountry cuisine. 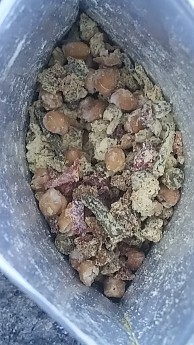 I won’t go into that detail again but I will say that this product continues to improve on the list of healthier, all-natural alternatives in dehydrated meals. I now pay better attention to calories/oz. or gram, protein, salt, preservatives and whole-food contents. 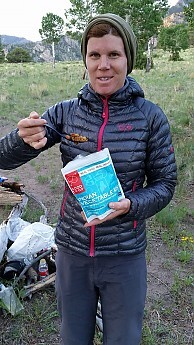 Those that have put in a hard day in the backcountry can side with me when I state that most any food will taste good when you’re hungry enough. But that taste often comes at the cost of added salt and preservatives, which is usually not a good thing. The GTG Indian Vegetable Korma has a reasonable amount of sodium at 690mg or 29% daily value (DV) per serving. I’ve seen other similar products with as much as 45% DVPS sodium. 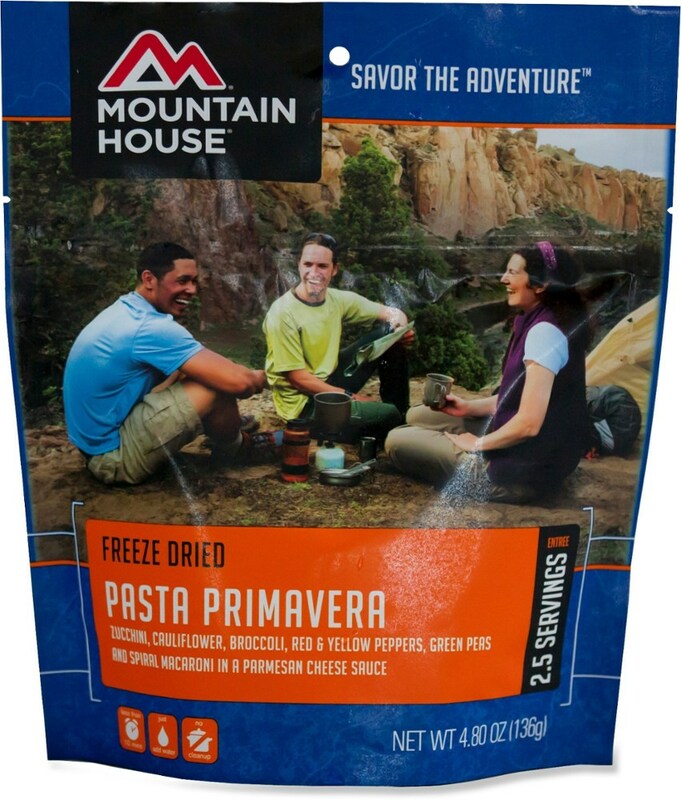 For those that have ever treated a double serving package as a one person complete meal (a realistic prospect for most long-distance backpackers), it’s easy to reach a max sodium DV in just one sitting. Despite having relatively little added salt, the meal is well-spiced, unique, and hearty. In a taste test with a number of similar Indian restaurant dishes, I would have a hard time picking this out as the dehydrated meal. I also enjoyed the rich smell…so many spices is the signature of good Indian cuisine. If you’re a newcomer to Indian food, you might want to try the meal before hitting the trail, just to make sure the spice level doesn’t bother you. I love spicy foods, so I enjoyed that there was just a bit, but I would rate it at the very mildest end of the range. The meal is good on its own but would pair well with chips, crackers, or tortillas. It also makes a great side. Look at the pictures—the before and after dehydration contents even look delicious! I felt very satiated when I ate these meals. 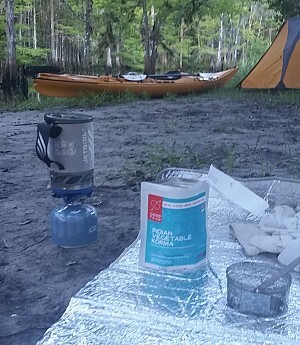 I had the single-serving for dinner on an overnight paddling trip and I shared the double-serving with my husband for dinner during an overnight backpacking trip. I ate the same supplementary kinds of snacks and meals that I would normally eat for such moderate activities. I did not feel hungry or wanting more after either meal. A lot goes into this equation, so it’s hard to say if my experiences would translate into similar experiences for others. 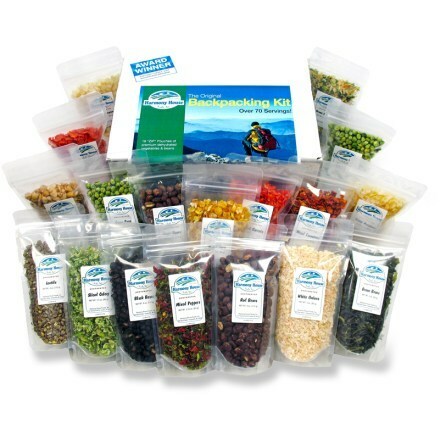 I was also hoping to provide some comparisons to other backpacking meals, but in looking at the fairly large collection that I have in my pantry, I realized that there is just too much variation among manufactures and among different meals by the same manufacturer to make any fair conclusions. What can be standardized is the calorie content per serving, and if you’re really focused on getting the best bang for your buck, calories per ounce. GTG states that all their meals have an average 375 calories per serving. The Indian Vegetable Korma comes in at 390 calories per 95g. This equates to about 116 calories per oz. To put things into perspective, almonds offer about 160 cal/oz. and a ProBar 125 cal/oz. GTG meals all come in resealable, foil-lined packaging that is slim (for easy packing) but with an expandable, flat bottom (so they can stand upright). The idea here is that the user just has to add boiling water (250/500ml), mix, reseal the bag, and wait while the contents cook/rehydrate. The packaging is durable with smooth interior contours, facilitating those well-endowed with a long handle spoon to scrape every last bit from the bag. The downside of this well-designed and multi-purpose packaging is that it is relatively heavy. Empty, a single serving package (including oxygen-absorber pack) weighs 21 grams or .7 oz. 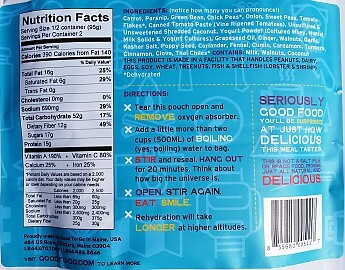 ; a double serving of packaging weighs 32 grams or 1.1 oz. Those concerned about such weight would do well to repackage the contents in a lightweight zip-lock bag and employ either the cook-in-a-pot or zip-lock/cozy cook methods. The former might well be the best method, given what I am about to report next. The biggest downside to GTG meals is that they take longer to rehydrate than many comparative options. This meal calls for a minimum of 20 minutes. Passing the time while starving is one thing but the bigger concern here is how ambient temperatures can turn your meal into a cold one, if proper precautions are not taken. One test took place in warm south Florida, so after 20 minutes, the meal was still suitably hot. Conversely, a brisk evening at elevation in Colorado resulted in a lukewarm meal. Such cooler conditions necessitate the use of some sort of cozy to insulate the meal. In a pinch, even a sleeping bag will do…but then again, in bear country, it’s best not to mix the two! Here is where the two aforementioned methods of cooking the contents in a pot or in a zip-lock bag w/ cozy may make the better sense. Further, some of the contents of this meal did not fully rehydrate in the allotted 20 minutes. The chickpeas seemed to be the culprit. For future preps of this meal, I would consider bringing the water to a boil in my pot, adding the contents, cooking on low heat for an additional 2-5 minutes, and then setting the pot aside inside a cozy for the remaining time. 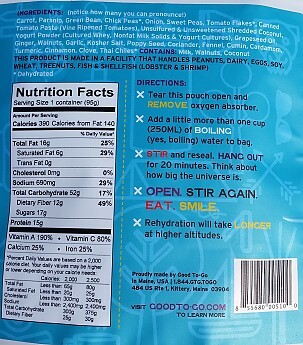 This means that some extra fuel is required and a pot has to be cleaned, but this may be negated by the weight saved in re-packaging and better outcomes in the consistency of the meal. I found the claims of "natural, healthy, tasty, and low in sodium" generally true. The ingredient list reads easily and makes you feel at ease. And at the end of the day, the meal does too. 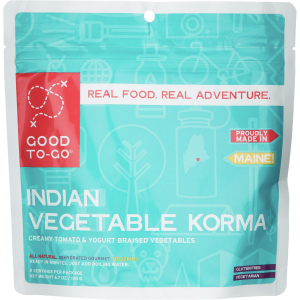 Best For: The GTG Indian Vegetable Korma is a good option for those seeking a healthier alternative in backpacking meals. 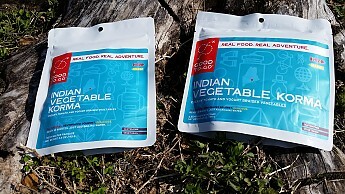 It is also a great option for anyone that relishes Indian food in the backcountry (or even at home). Retail for these meals is $6.75 for a single serving and $11.50 for the double. For that you get 3.4 oz. and 6.7 oz., respectively. Given the small size of the company and quality ingredients, the higher price is understandable. What I would really like to see is a bulk packing option…say a 20 or 30 serving bucket. This would reduce the cost of packaging and hopefully make the meal more affordable for diehard fans that want to portion and package themselves. 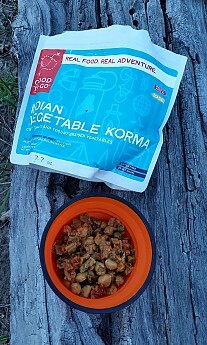 I love me some good korma, but have never tried it in the backcountry. I find the best way to eat korma is with a finely sliced pear and cilantro on top. Great suggestion Kiwi, good to know!